An IRA may invest into a real estate investment trust. Real estate investment trusts (“REIT”) are trusts whereby the company undertakes certain real estate activities (e.g. own or lend on real estate) and returns profits to its owners. An IRA may invest and be an owner in a REIT. As many self directed IRA investors know, a form of unrelated business income tax (“UBIT” tax) known as unrelated debt financed income tax (“UDFI” tax) can arise from real estate leveraged by debt. 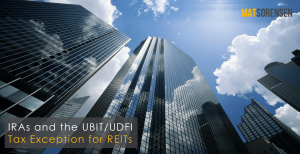 Many REITs engage in real estate development activities and/or use debt to leverage their cash purchasing power and as a result may cause a form of UBIT tax known as UDFI tax to IRA owners. Most REITS will not pay corporate taxes and as a result will not be considered exempt from UBIT tax as a result of having paid corporate tax. However, income from REITs is still typically exempt from UBIT and UDFI tax because the definition of a “qualified dividend” in a REIT has been defined to include dividends paid by a REIT to its owners. IRS Revenue Ruling 66-106. Qualified dividends from a REIT are exempt from UBIT and UDFI tax. REITs can be publically traded or private trusts but are not easy to establish. They require at least 100 owners and must distribute at least 90% of their taxable earnings to their owners each year. Despite the general application of exception to UBIT/UDFI tax for REITs, a REIT may be operated in a manner that will not allow for qualified dividends to be paid and therefore income from the REIT would not be exempt from UBIT/UDFI tax. If you’re investing into a REIT with an IRA, make sure you know whether the REIT intends to be exempt from UBIT/UDFI tax or not. As discussed, most will be exempt from UBIT/UDFI tax but some REITs may choose to operate in ways that will not qualify for the exception. Because UBIT/UDFI tax is about 39% at $10,000 of annual income this is something every IRA should understand before investing into a REIT.